In 1987 two of us (Poole and Rosenthal, 1987, forecast the Senate confirmation vote on Judge Robert Bork based upon Senators' announced positions and an early one-dimensional version of NOMINATE. The forecast was that Judge Bork would fail to be confirmed by a vote of 41 for and 59 against. The actual vote was 42 for and 58 against with only 7 forecasting errors. Last November the four of us forecast the vote on Judge Roberts using a similar methodology. Our forecast was that Judge Roberts would be confirmed by a vote of 69 for and 31 against. The actual vote was 78 for and 22 against with 11 voting "errors". Below we apply the same methodology to forecast the confirmation vote for Judge Samuel Alito. We forecast the Alito vote using the Poole and Rosenthal DW-NOMINATE ideological scores (technical details). The result is shown below. The predicted cutting line is based upon announced positions as of 20 January 2006. This cutting line (the best spatial division using the early announcements) predicted a vote of 56 for and 44 against. This forecast produced 4 voting "errors", that is, inconsistencies with their past voting behavior. 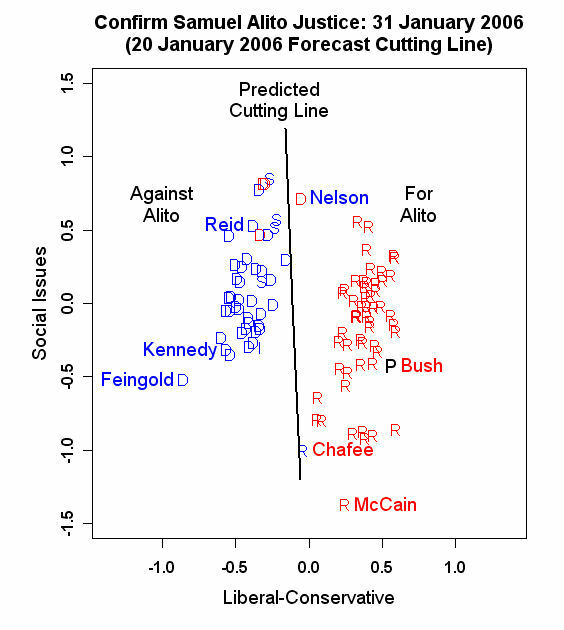 Aside from Chaffee (R-RI), the cutting line forecasted a week before the vote it remains the best line for forecasting the Democrats based upon the spatial theory of voting, which predicts geometric consistency within the patterns of roll call votes from the same individuals. Note that the line can be moved past Chaffee thereby producing on 3 voting errors [Conrad (D-ND), Byrd (D-WV), and Johnson (D-SD)].